Joensuu is a city and municipality in North Karelia in the province of Eastern Finland. 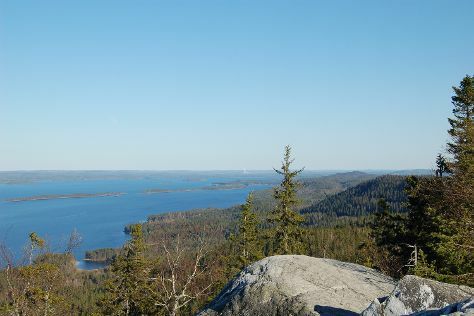 You'll find plenty of places to visit near Joensuu: Olavinlinna Castle (in Savonlinna), Koli National Park (Pielinen & Ukko-Koli Hill) and Lusto - The Finnish Forest Museum (in Punkaharju). There's still lots to do: take in nature's colorful creations at Botania - Botanical Garden and Tropical Butterfly Garden, test your team's savvy at popular escape rooms, make a trip to Sculpture Susi Kosiomatkalla, and enjoy breathtaking views from Puijo Tower. To see maps, reviews, where to stay, and more tourist information, read our Joensuu day trip app . In April, plan for daily highs up to 6°C, and evening lows to -2°C. Finish up your sightseeing early on the 22nd (Mon) so you can travel back home.